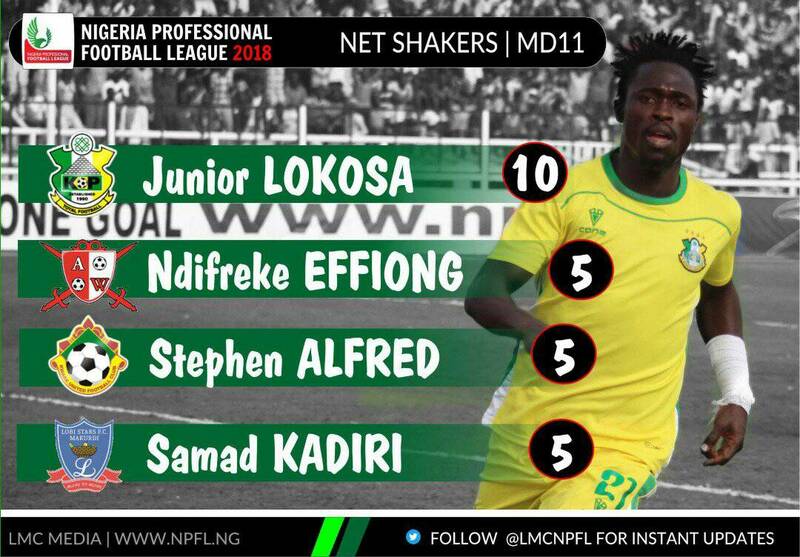 If the exploit of Junior Lokosa in the 2018 NPFL season is a fluke then, it has been 11 weeks of flukes. The Kano Pillar forward has gotten to the back of the net ten times in eleven NPFL games thus positioning his team temporarily at the top of the table. Not much is known about his age but one thing is certain, he has an ability to deliver in front of goal. The possibilities are endless for Lokosa if he can manage to show consistency till the end of the season. Now with the current form and statistics, he may as well end this season with about 30 goals in the NPFL and well close to 35 goals in all competition this season. His technical ability is somehow in question as he did not make it to the CHAN tournament and for obvious reasons may not also make it to the world cup.